A magazine especially dedicated to church elders and to strengthening and motivating church leaders. It provides inspirational material that can also be helpful when facing the difficulties of leadership. 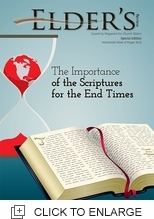 It contains sections and interesting articles for church leaders.